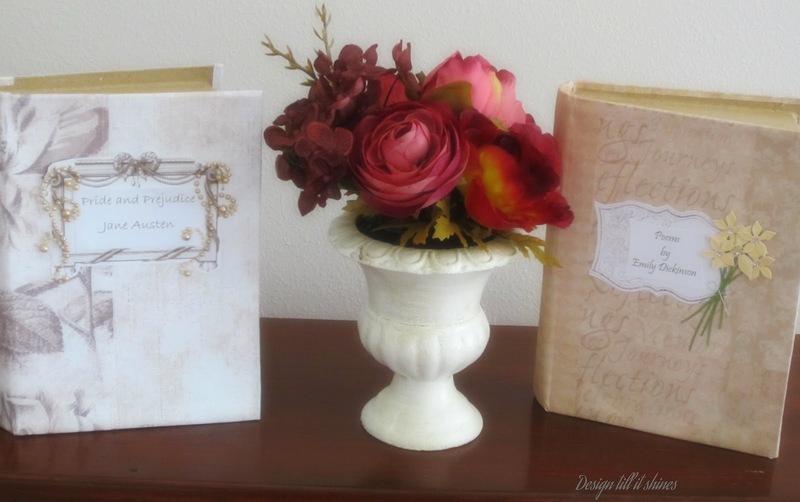 I haven't had time to get some of my fall displays ready so I decided to show these decorated book boxes. Even though this was an easy project, I think it makes a unique decorating accent to go with fall decor. This isn't a tutorial but I wanted to show how I started the project. 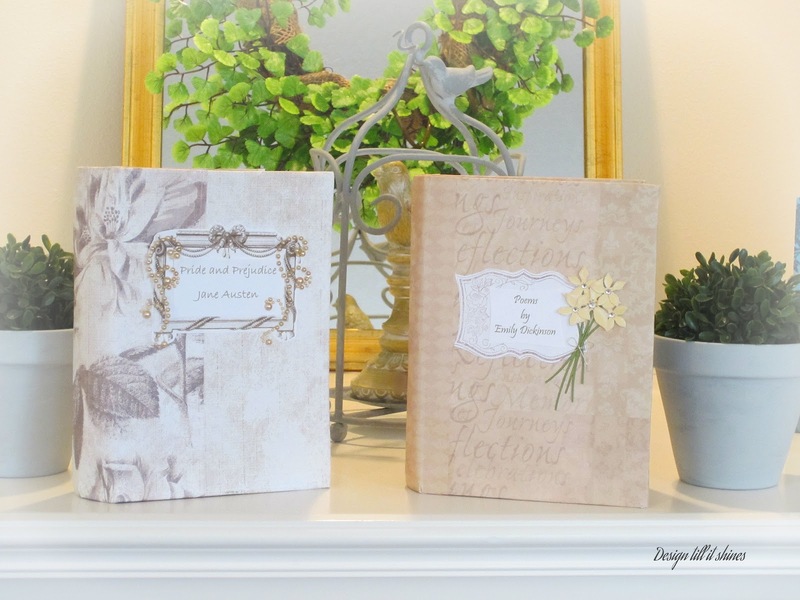 I used some decorative papers that looked vintage and I thought they would work well for my book covers. I knew I wanted to decorate them as books so I decided on a theme I wanted for each book and decorated them that way. I only decorated the front and back of each box. This went fairly easily and I used mod podge to glue on the paper. I decided to just put decorative paper on the spine of the book to make it easier. I knew I wanted the front of the books to be the focal point. I decided to feature female authors from the 1800's. 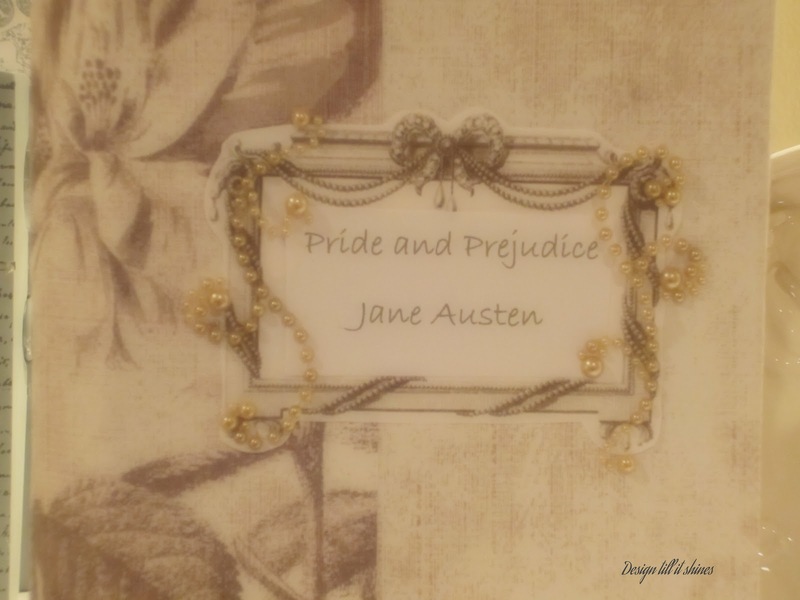 I chose Emily Dickinson for her poetry and Jane Austen for her novel Pride and Prejudice. 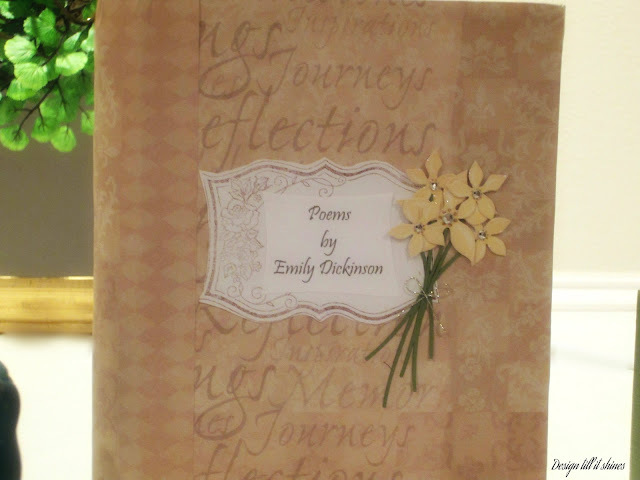 I really appreciate poems much more than I used to and Emily wrote so many lovely ones. I've also become interested in historical novels, so I have a lot of reading to do! 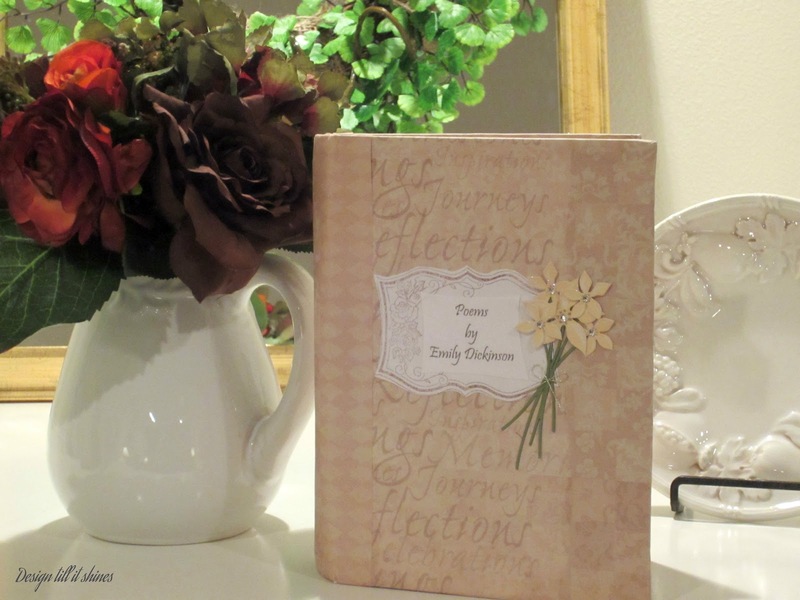 I found a stamp with a vintage style frame and added the title and some flower embellishments. I like the way the paper on the book connects with the author. I softened this one quite a bit. The pearl accents were a little too strong. I found a frame from the Graphics Fairy and added it to the book. I wanted something a little flashier for the novel so there would be a contrast between the two. 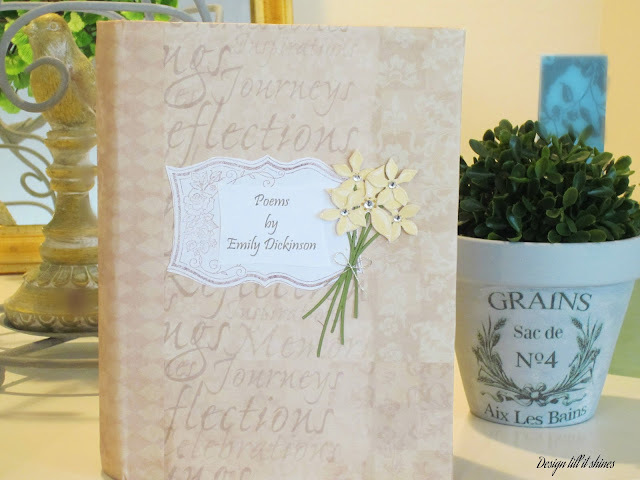 I like the simplicity of the poems book the best though. I added this fall themed plate and the pitcher with the fall roses to the mantel. I took most of these pictures at night. I think the shadows add somewhat of a dreamy look to the pics. The roses in the urn were on clearance at Michaels. I love their sweet simplicity. There are so many great deals on fall decor you just never know what you'll find. Thanks for stopping by. Onward to fall decorating! Hi Diane! 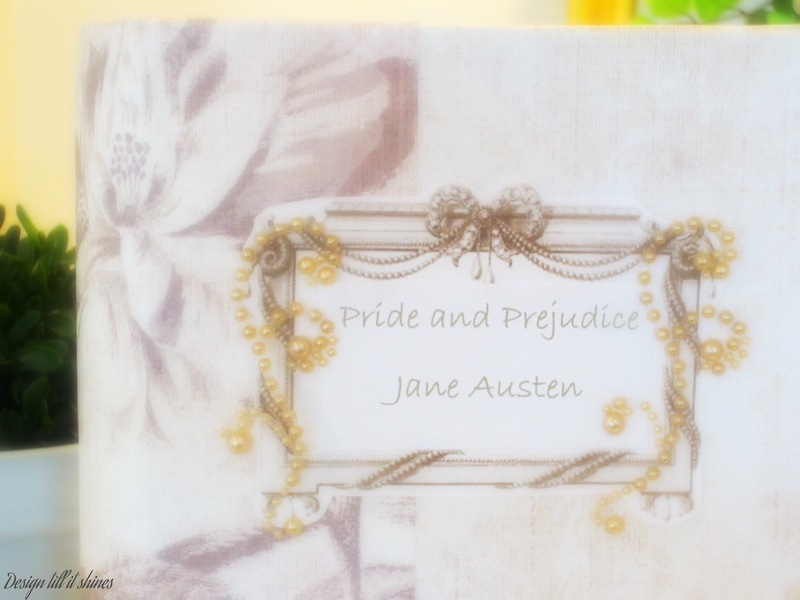 Love your decorated book boxes! There is so much I'm learning from bloggers . . . trying new things. I've never worked with decorative papers, but after looking at your beautiful items, I'm going to give it a try. They are so pretty and unique. Thanks for the sweet comments about my book covers. I always look for something a little different for fall and I love the idea of decorating with beads as an accent. Thanks for following back. Very pretty, Diane! 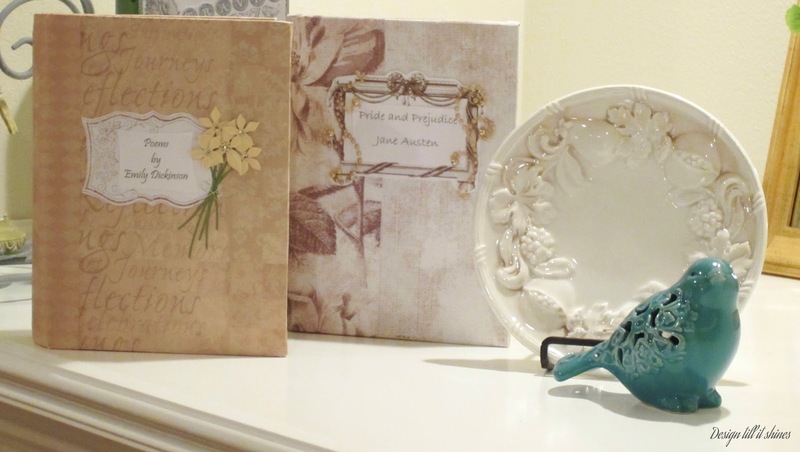 Thank you for sharing your creative project at Potpourri Friday! Your book covers are so lovely. Beautiful job on them! Thank you for joining TTF this week. Have a fun weekend! What a great job--they look beautiful! So pretty Diane. I tried this once before and it was a fail. You did a great job. Thanks for sharing. Your book covers are lovely! Thanks for visiting me and becoming a follower! I'm your new follower as well! What a beatutiful idea. Thank you for visiting me, I followed back. Beautifully done. Thanks for sharing on Shabbilicious Friday. I came over from Brenda's to look at your gorgeous book covers! And you are another Diane! It's nice to meet you! I'm Diane,too! lol Hugs!